Bear is the latest addition to the Jo’Burger family. It resides on South William Street, in what used to be Crackbird’s second incarnation. It has opened with considerable fanfare owing to the loyal Jo’Burger/Crackbird/Skinflint crowd and a well-known backer in the form of Irish rugby star Jamie Heaslip. With all this (understandable) hype, would a newly opened Bear be a worthy member of the Jo-family? On entering the restaurant, I was greeted by the smell of fresh-paint and I immediately had pangs of worry. I think it is only fair to let restaurants settle in before passing judgement as a punter, so I was immediately concerned that I had visited too soon. I was wrong. After the rest of our party arrived, we were seated by Mr. Jo’Burger himself. All of us had been in the restaurant when it was Crackbird 2, and it looked very different. ” It’s posher than Crackbird isn’t it?” He joked. It retains roughly the same lay-out, the kitchen now visible at the back, with a bar along one wall. Exposed lightbulbs provide a cosy glow, and diners are seated at long-tables. After sitting down we got straight down to the menu (available here). There is a fantastic array of meats, to satisfy even the hungriest carnivore. There are meats for single portions and then cuts to share. 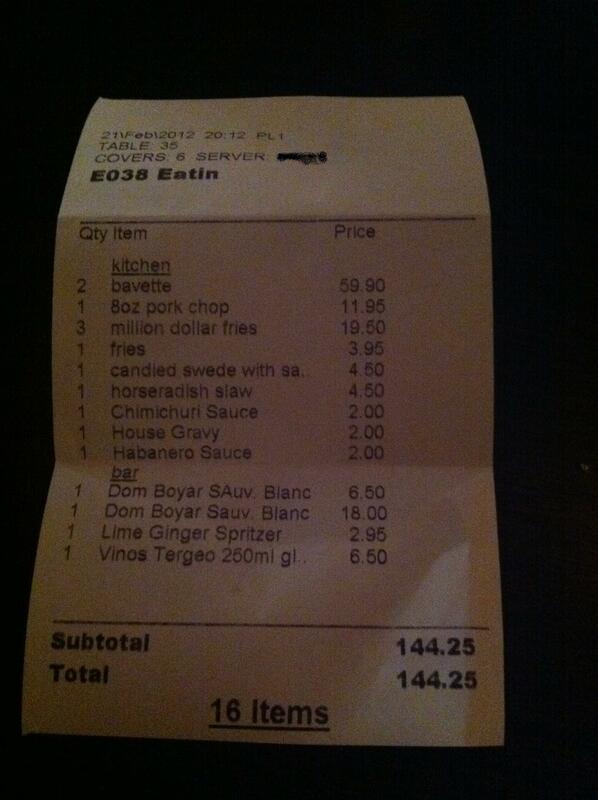 Myself and my better half split a bavette , as did three of our less hungry companions, with one opting for chicken. The steak was well-cooked and very flavoursome. The image on the left- is roughly half the meat you get, and thus is incredible value for €29.95. There is a nice selection of sides in BEAR- the million dollar fries (above left) were the first to catch our eyes. 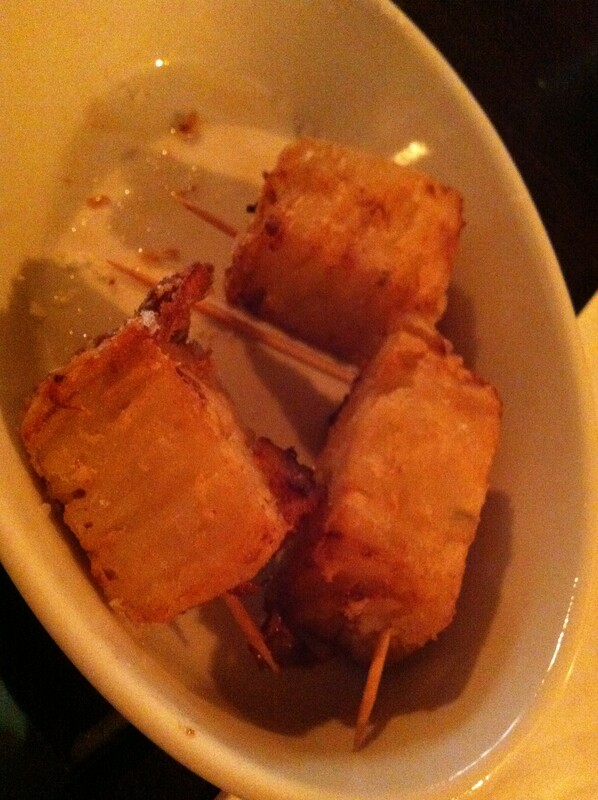 They are slices of dauphinoise potatoes, deep-fried. I worried they would be greasy, but I was very wrong, they came out lightly crisped, with a luxurious center. Some other sides that were well received were the horseradish slaw, a very refreshing side, and the candied swede with sage was impeccable. On the table there is a barbecue sauce (which I could swear had a hint of cardamom in it) and ketchup, but if you are feeling slightly more adventurous, the 3 sauces for a fiver is a tasty addition to the meal. The wine-list is solid and the Bulgarian Sauvignon (€18) was a very pleasant accompaniment to the meal. They do their own soft drinks (served in jam-jars) as well as some beers. As I write this, I must remark that upon our visit- BEAR was in its 5th day of operation, yet the meal was flawless. In a time when restaurants are going under with remarkable pace, to say Joe Macken is bucking the trend would be an understatement. In the last year he has opened three restaurants in Dublin. They are restaurants that are not afraid of doing a few dishes well, and this bravery has been rewarded. The Dublin culinary scene would be poorer without them. Service throughout was brilliant. Attentive without being overbearing. The 6 of us thoroughly enjoyed our meal, were incredibly well fed and have been in communication today remarking on our satisfaction. You will not get better value in Dublin.